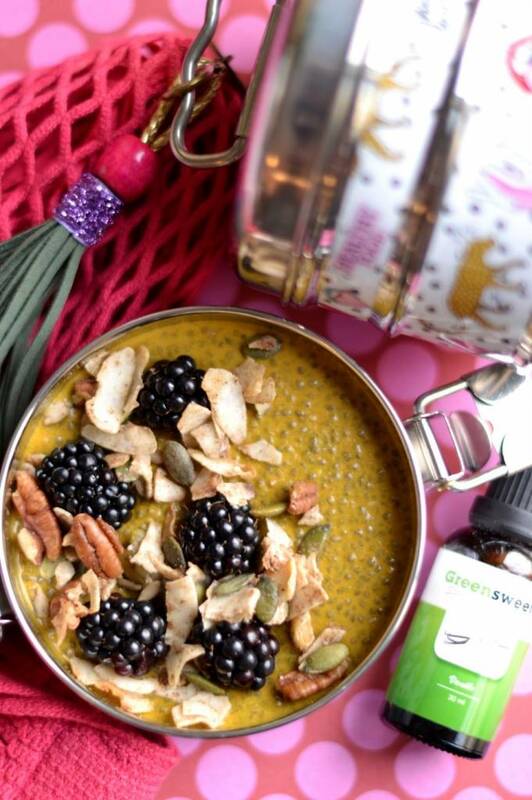 Delicious pumpkin chia pudding, a recipe from Manon from Vegan Flavors in which she has processed Greensweet liquid stevia vanilla. 6-8 drops of Greensweet liquid stevia vanilla. Topping: fresh blackberries with homemade granola. * you can use any vegetable milk for this recipe. Wash and cut the pumpkin into coarse pieces. The shell does not necessarily have to be removed. Put all ingredients (with the exception of the Greensweet liquid stevia and chia seeds) into the blender and make an even smoothie. Season to taste with the Greensweet liquid stevia vanilla and mix it for a while. Pour the smoothie into a bowl and add the chia seeds. Stir well and let stand for 10 minutes. After 10 minutes stir well again and then you put the dish in the fridge and let your pudding stiffen. Finish your chia pudding with what you like. I opted for fresh blackberries and some homemade granola.